Khorosho Productions: Resistance Cell Special Offer is back! Resistance Cell Special Offer is back! In lieu of a new release (I dropped a printed part...), I've decided to run the Resistance Cell Special Offer again for a limited time. £26 for the Cell Officers and two packs of Resistance Fighters, saving over 10%, even more if you purchase multiple cells! The offer runs until the 27th of May or while stocks last. 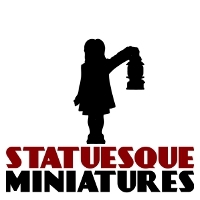 I've also just sent the second Statuesque Newsletter. You can read it HERE. Sign up NOW!